It’s April! It feels springy! The river is running! Every year, Liquid Adventures holds the Cheat River Training to help paddlers prepare for the annual Down River Race (now an an International Canoe Federation Ranking race – register here!). Read below to learn more about this cool group! “What is Cheat Training?” When you see 40 DC boaters on the Cheat River every Saturday in April, you may ask that question. The short answer is that Cheat Training is two months of paddling with Calleva, in DC and WV, to get you in shape for paddling the Cheat Canyon Race. Our goal is to get intermediate paddlers ready to run the canyon without a leader; looking out for themselves and each other. But it is so much more than that! When folks sign up, I am not sure they truly understand what they are getting themselves into. It will snow, and we will paddle. While this sounds miserable, and it is, you are miserable with 40 of your friends. The truth is that it really isn’t that bad. It’s lovely, actually. You push yourself to a different place, dig deep, and come out the other side stronger and more confident. Those snowy, cold, ice-on-the-brim-of-your-helmet type of days are the ones that Cheat Trainers talk about for years. 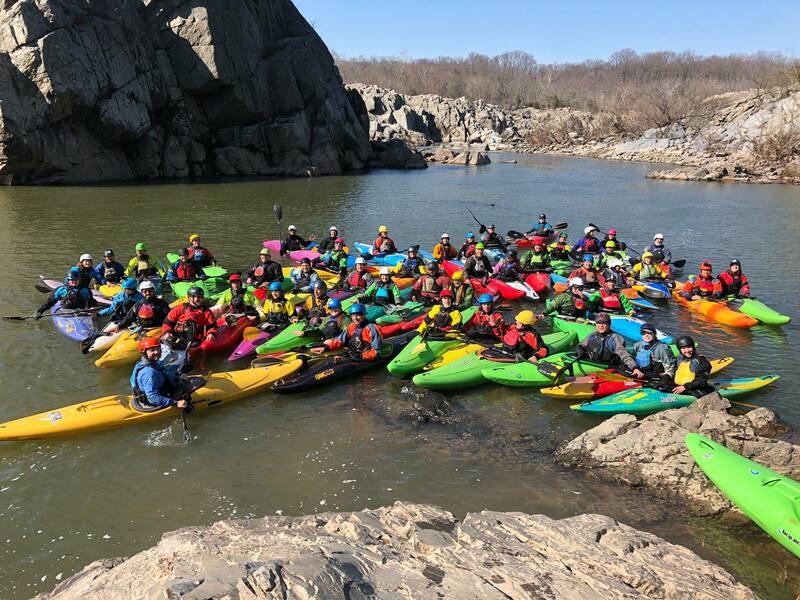 On Saturdays in March we paddle downriver on the Potomac, from just below Great Falls, 11-miles down to Sycamore Island. It is a lot of flat water; exhausting but also awesome. By the time we drive up to the Cheat in April, we have a month of endurance work under our belts and are ready for the 10+ miles on the Cheat. And what an incredible 10 miles it is! Cheat Trainers get to see spring hit the canyon. The first weekend often offers frozen waterfalls and baren trees. By the time the race comes around, that first Friday in May, the sun is glaring and the trees are green all the way up the canyon walls on each side. We get to know the river at a variety of water levels and temperatures in springtime. We come for the paddling, but we all stay for the community. Our long boat pushers are an amazing bunch on their own, but surround them with 40 of their peers and things start to get turned all upside down. At any point during Cheat Training you could cry from laughing at Jon Becker, get handed a homemade beer from Mark Eakin, get thrown in a van by Tom that fits 12, but there is already 20 in there, or wait an extra for shuttle because a tree has fallen across the take out road. Cheat Training to me is so much more than just a paddling event; it is a lifestyle, a rite of passage for paddlers on the Potomac River, and most of all an adventure with friends. I wait all year for Cheat Training to start and I am always sad when it ends, but I know that the memories I have made with everyone will hold me over till March the following year.